Back in late September, JKosmmune (jay-kawz-myoon) sent me a trio of their skincare products to try and I used them for the whole month of October to now (about 6 weeks). I was thrilled when they sent me their items, as because JKosmmune’s focus and key ingredient is Beta-Glucan. If you remember, almost 2 years ago, I reviewed Graymelin’s Beta Glucan Amoupule and I loved it! It is one of my favorite items to use during the colder weather. However, it is a bit sticky and I really just use it at night time. JKosmmune is nothing but Beta-Glucan, so my options for skincare with Beta-Glucan has been expanded! From JKosmmune: Beta-glucan is a natural biopolymer derived from mushrooms, yeast, algae and plants. It has been scientifically and clinically studied for the past 50 years at numerous universities and teaching hospitals. JKosmmune Beta-glucan is naturally secreted in a soluble state with over 99% purity, which results in a deeper and more powerful moisturizer. 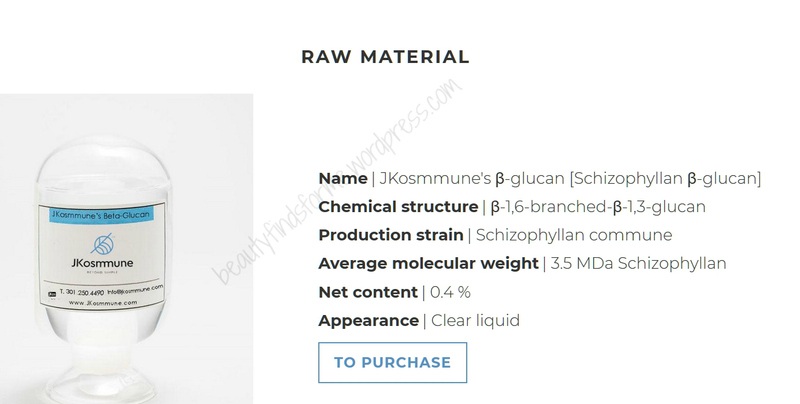 JKosmmune Beta-glucan is NOT encapsulated in its natural state, meaning there is no need to chemically breakdown the capsule, which can introduce chemical impurities. We maintain this high purity and concentration with careful formulation, which ultimately maintains the high potency of Beta-glucan. What is Beta Glucan (β Glucan) and Why Does Unboxing Beauty Love It So Much? I did a lot of research a couple of years ago on this so I think it is only fair to me that I can repeat what I originally wrote about this fascinating ingredient. In a nut shell, it is a compound that is naturally derived from mushrooms, oats, yeast and grains. It helps stimulate the production of collagen, speeds up wound healing, soothes and calms skin due to its anti-irritant and strong anti-inflammatory properties, moisturizes, locks in natural moisture, anti-aging and anti-wrinkle due to its anti-oxidant properties and also helps repair your moisture barrier. 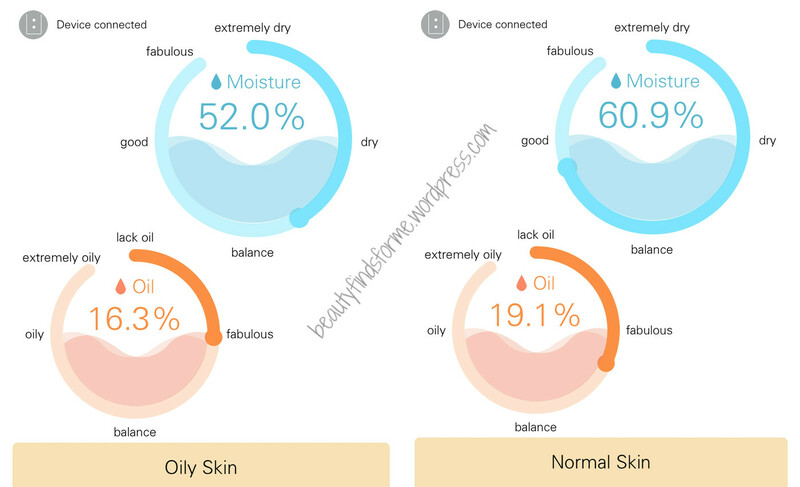 Beta glucan is considered the “3rd” generation of moisturizing agents. The first generation is glycerin, which is very affordable but only keeps moisture from evaporating. Hyaluronic acid, which I love and use, is the second generation and it is one of the ingredients that exists normally in our body which helps provide collagen and elastin production. Hyaluronic acid production starts to decline once in your late 20’s. Beta glucan was created originally to strengthen the immune system and is 20% more effective at moisturizing than hyaluronic acid. It protects skin from UV rays as well. It helps reduce redness and it is a good ingredient for sensitive skin, so long you aren’t allergic to yeast, oat, grains and mushrooms. Beta glucan helps heal and build our immune system, fighting off bacterial and viral infections, it also helps rebuild our skin’s surface cells and to help restore collagen, by stimulating the skin tissue. This is helps cellular turnover by creating new fresh skin cells while supporting existing structural cells. It can penetrate deeply into our cellular matrix and get into the lower levels and help prevent wrinkles from where they are formed. It was thought for a long time that the Beta glucan molecular structure was too big to pass through and be absorbed into our skin, but recent studies have proven that incorrect. 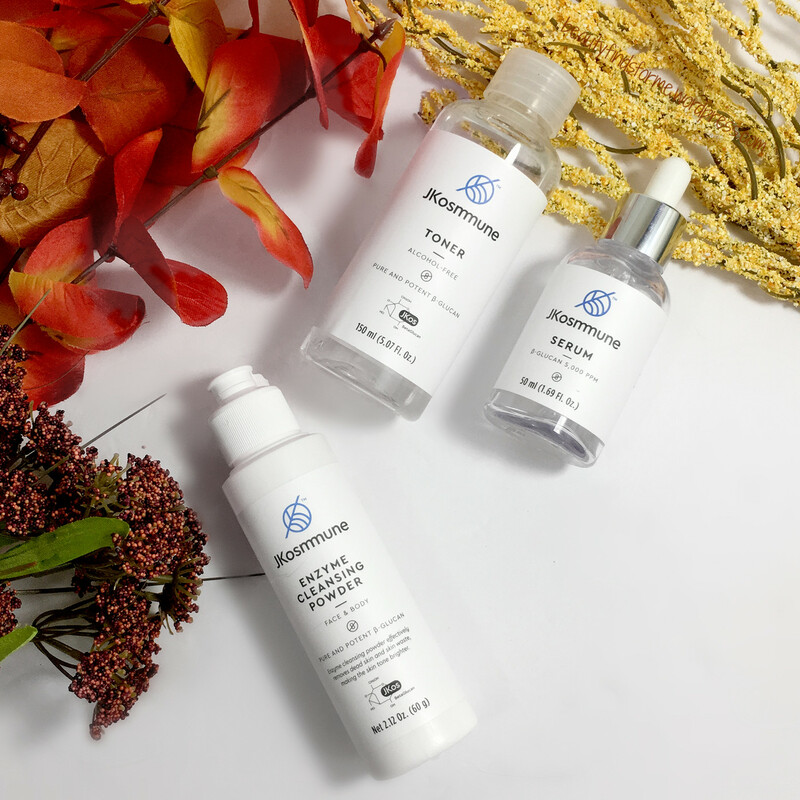 I love beta glucan because it really helps hydrate my oily skin in the fall and wintertime, as during the cooler months, my skin gets dehydrated. It hydrates, protects, repairs my skin ~ I still get blemishes and plump up my skin all without being oily or greasy. Graymelin’s Beta Glucan Amouple is a staple in my nighttime winter routine, but I want to find more beta glucan products to try and also use them during the daytime. 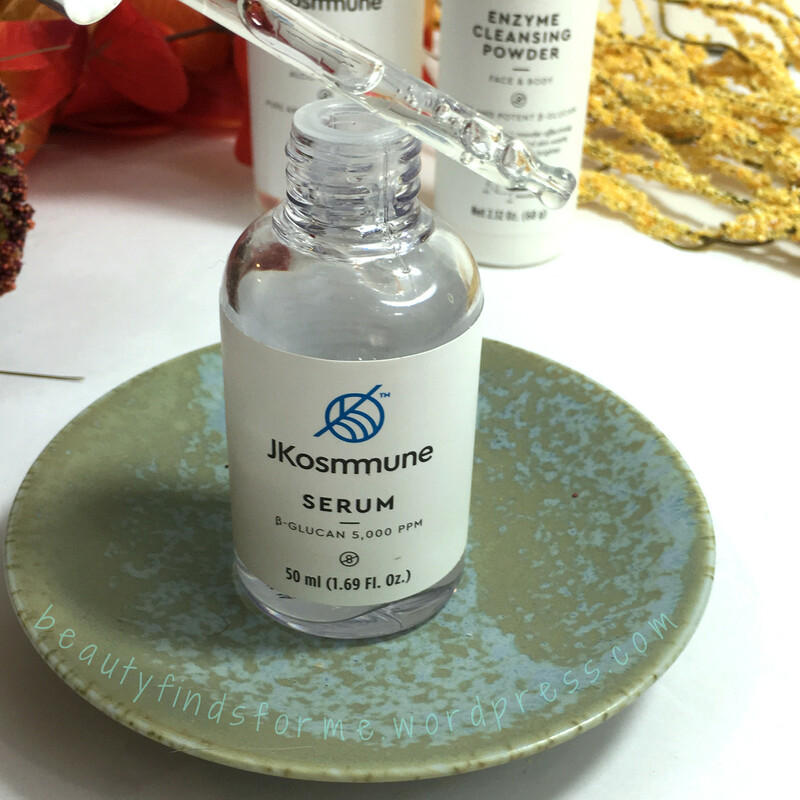 JKosmmune’s beta glucan is derived from fungi schizophyllum commune, which is water soluble, leaving your skin supple, smooth and firm. 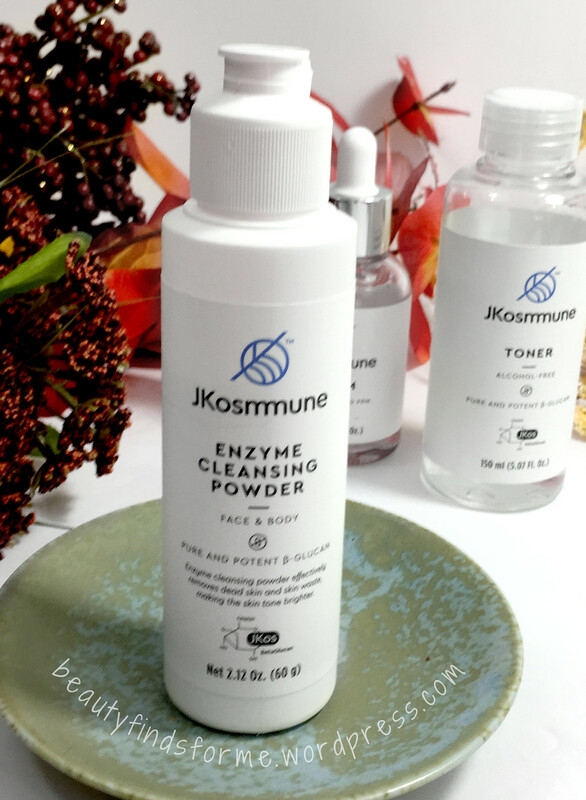 JKosmmune Enzyme Cleansing Powder I LOVE enzyme powder cleansers (see my reviews here) ~ if I mention another brand here, I have reviewed it, so you can see the photos and results. They seem to be all the rage now and my favorite Naruko one seems to be discontinued, so I have been trying a lot of different powder enzyme cleansers lately. I think I have found my replacement right now. For those who do not know what an enzyme cleansing powder is, I will repeat my standard information on them: Enzymes in skin care have two functions ~ exfoliation and to help reduce swelling, tenderness, redness and pain ~ anti-inflammation. Enzymes can be very gentle and are a fantastic replacement for facial scrubs and microdermabrasion products, such as Dr. Brandt Skincare Microdermabrasion Skin Exfoliant and Derma E Microdermabrasion Scrub ~ those products can be too harsh for your skin and could exacerbate the skin issues you thought the product was going to handle! Enzymes break down the upper layer of skin which contains dead skin cells that contains keratin and whisking them away ~ literally decomposing the skin cells. By breaking down keratin, your skin is smoother and silkier. Some of the best fruit enzymes are papaya (papain), blueberry and pineapple. Now, some people use these foaming powder cleansers to replace their second cleansing/foaming cleanser step but I do not ~ I actually triple cleanse in the morning and use a powder enzyme cleanser after the foaming cleanser step, with my Foreo Mini Luna or the new e.l.f. Massaging Facial Cleanser Tool. For my oily and not sensitive skin, I can do this daily. This not only contains the 99.9% pure beta glucan, but has some other nice ingredients in here ~ most importantly, it does contains papain, an anti-inflammatory and anti-bacteria enzyme is derived from papaya. It will exfoliate your skin without irritation by gently loosening dead skin cells and removing them from your skin. Just like Wishtrend’s new enzyme cleanser, this contains two gentle surfactants: plant derived sodium lauroyl glutamate is made from amino acid and fatty acids, and leaves skin soft and smooth. Sodium cocoyl isethionate is a fatty acid, coconut derived surfactant, which solubilizes oils, allowing water to mix with oil and dirt, so the grime is rinsed away completely. [source ] Allantoin is known for healing, soothing and softening skin, it also helps remove cracked and chapped skin, leaving behind healthy looking skin. Betaine is superior for its intense moisturization and hydration properties, without the stickiness, and also reduces the appearance of fine lines and wrinkles, while attracting moisture (humectancy) and relieving skin irritation. This does contain pollen extract, which is full of natural natural enzymes, vitamins and minerals, and can help detox your skin and speed up healing. However, pollen is a controversial ingredient ~ is it vegan or not? There are two arguments towards this and it is a personal choice. I mention this because I do know many of my readers are vegan. vegans might not be acceptable. There is no added fragrance to this enzyme cleanser. This cleanser comes in a tall, slim plastic bottle with a flip cap applicator ~ just pour out a bit, about the size of a nickle, in your hand and make sure to close the cap once done. You never want to get the bottle’s contents wet. I have never had issues with my enzyme powders getting ruined because I ensure that I firmly snap the cap back on. The grains are quite fine ~ not as fine as AmorePacific but one of the more finer grained enzyme powder cleansers out there. There is no scent that I can detect with this product. This foams up nicely for an enzyme powder cleanser ~ on the left side below, that foam is just by rubbing my hands together under water and you can see it creates nice soft bubbles. On the right side, that foam was created using Foreo Mini Luni device and the foam is bit more dense and smaller ~ there is a difference with foaming when you use one of those types of tools, but you can create foam and cleanse without them. 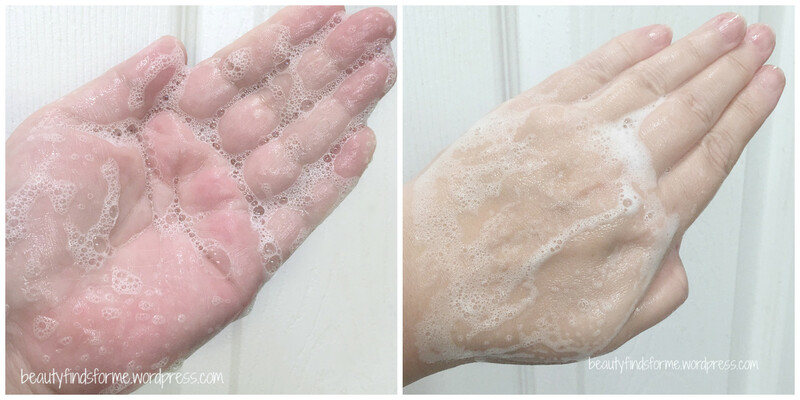 For those used to Tososwoong’s foam, they are an exception to the rule when it comes to enzyme cleansers, as Tososwoong does produce a TON of foam. The grains fully dissolve into foam and it feels silky smooth on my skin. After rinsing off, my skin looks brighter, smoother and very soft, without drying or stripping. This is why I LOVE enzyme cleanser ~ the results on my skin just feel and look so good and results are immediate. 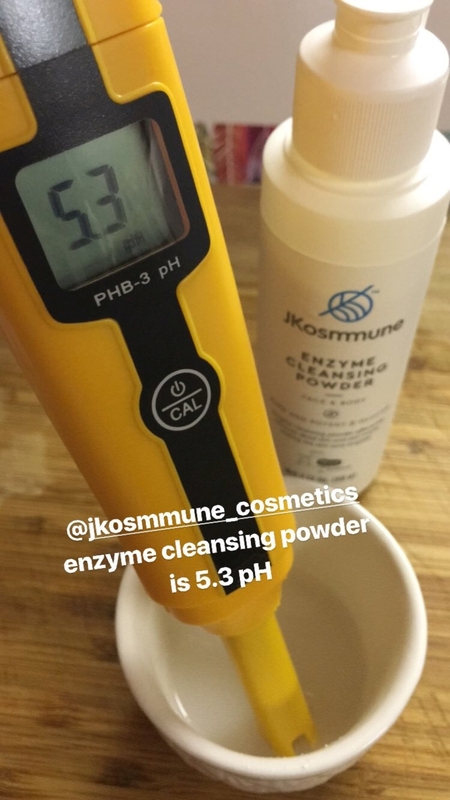 JKosmmune states that their cleanser has a pH level of 5.82, but I found it to be lower than that at 5.3 with my high pH water (9>)! So, for those looking for a lower pH foaming cleanser, this one is it. I normally do not care about pH levels unless I am looking for an acidic product to help exfoliate ~ this cleanser not only has the physical exfoliation with the grains, but chemical with papain and now with the lower pH. 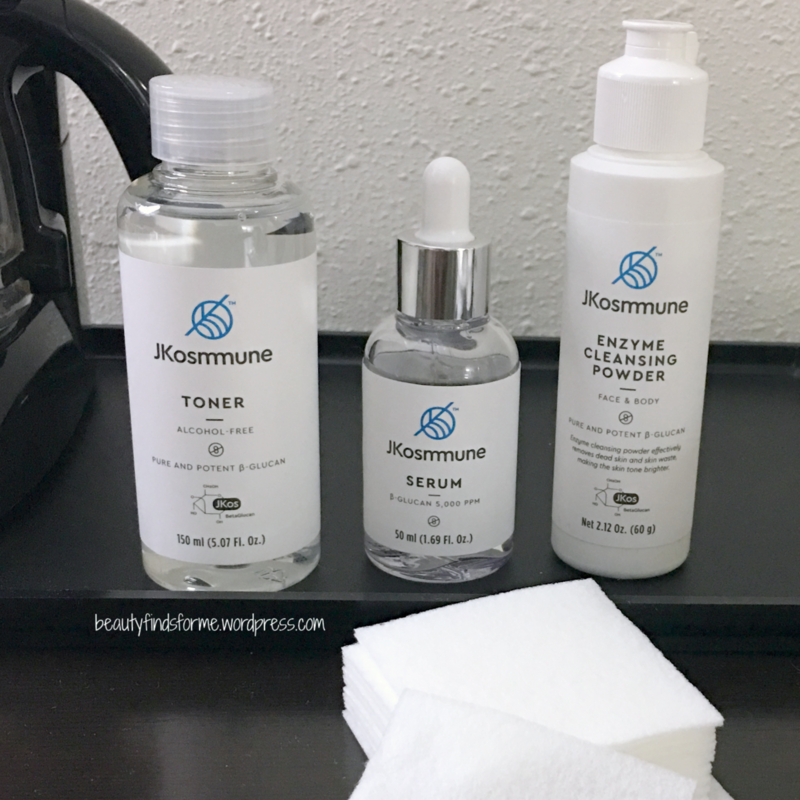 JKosmmune Toner I love my toners!! 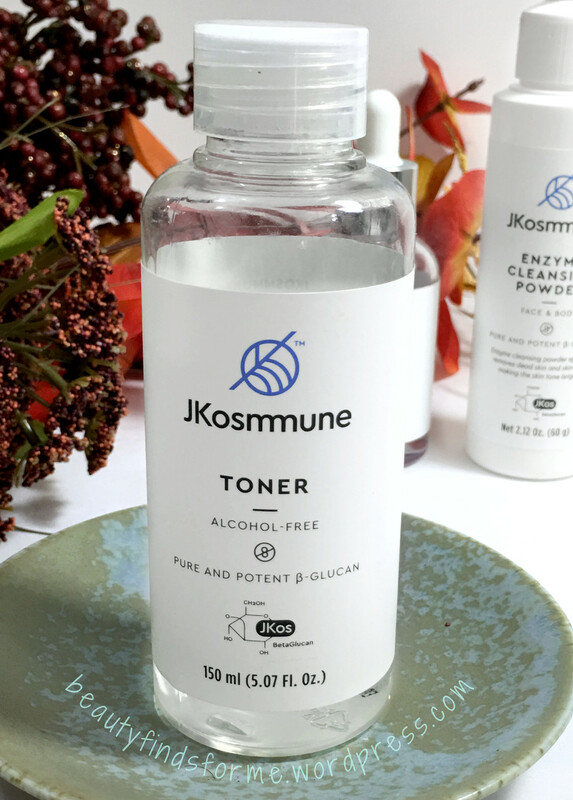 This is an alcohol free toner with only 10 ingredients ~ not only does it have 99.9% pure beta glucan, but contains some other brightening and hydrating ingredients. Glycerin and betaine are both humectants and will help provide additional hydration without stickiness. Licorice root (dipotassium glycyrrhizate) is a brightening ingredient as well as reducing flaking and smoothing your skin. It is also an anti-irritant and anti-inflammatory. Citric acid is an alpha hydroxy acid (AHA) and will help gently exfoliate and promote cellular turnover, so it will help brighten and smooth your skin, while hydrating your skin. This comes a small bottle, but it is 150 mL so contains a lot of product. This has a pin hole applicator and I either shake out this very watery, scentless liquid into my hand and pat on my face or use a cotton pad to apply. It is up to you how you like to apply toners! This has a pH level of 6, so it is mildly acidic but provides more hydration than exfoliation. That is fine, because this toner is not marketed as an exfoliate. The first time I used it, I went ahhhhhhh in happiness, as this is so cooling and refreshing on my skin. In fact, if your skin feels dry, sore, hot or what I like to called tired, this toner will feel so good. 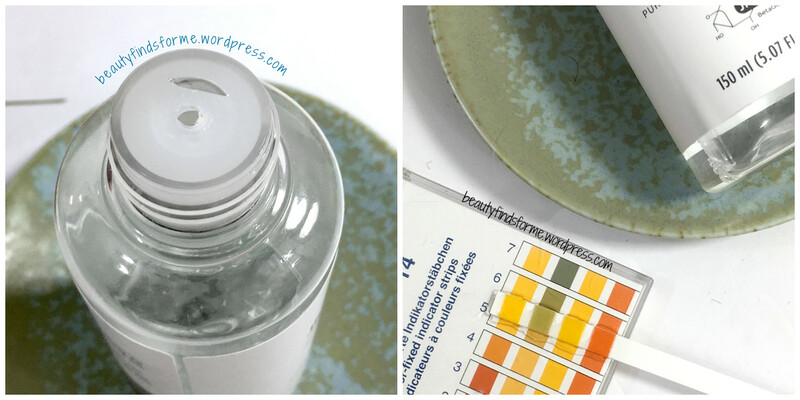 It is a watery toner, so it will evaporate quickly, but even with that, it increased my hydration by 17%, while decreasing my oil levels. It doesn’t leave a footprint on my skin, as it is not greasy, sticky and my skin just feels cool and refreshed. This toner is perfect for the 7-layer method as it dries quickly, while hydrating your skin. 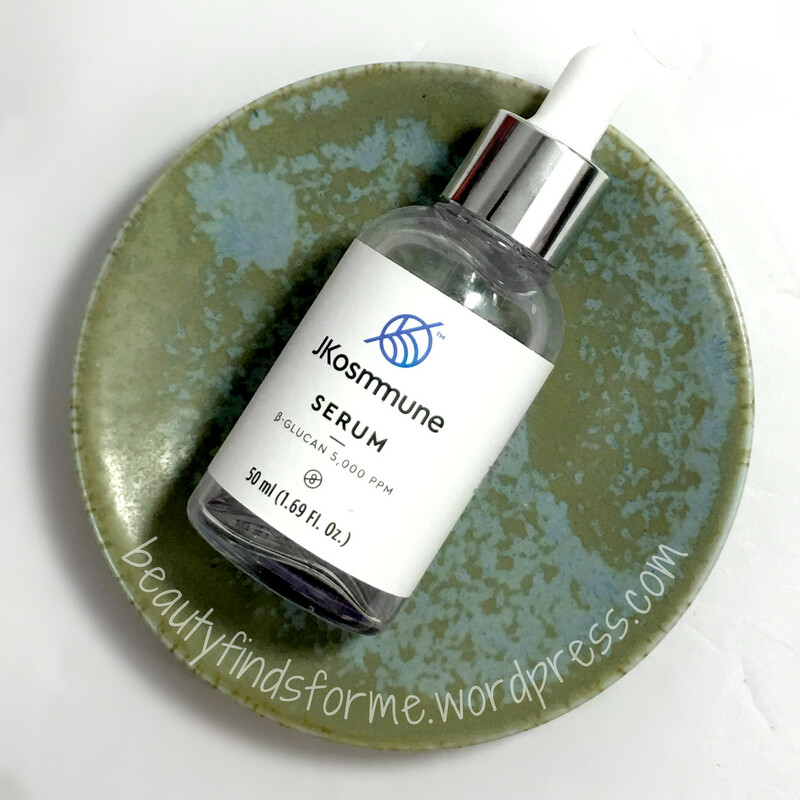 JKosmmune Serum This is another product that I was keen to try from JKosmmune as I love my Graymelin Beta Glucan Amouple, but it is sticky and heavier. I wanted a serum that I could use in my day time routine, so let’s see how this one worked for me. This serum only has 7 ingredients, including 97% pure beta glucan (5,000 ppm) and hydrating glycerin. This also has centella asiatica, which is one of my favorite ingredients ~ it is a common herbal ingredient that is used medicinally to help speed up wound healing, such as blemishes and skin rashes. It also helps minimize the appearance of pores. Another popular skincare botanical is portulaca oleracea, which helps prevent dry skin while soothing due to its moisturizing benefits. This is dermatologist-recommended, according to JKosmmune. This comes in a nice 1.7 oz clear glass bottle with an eye drop applicator. The serum is colorless and odorless and I can already tell that I can use this during the daytime, as it is a watery serum! It is VERY watery ~ I just take the applicator and drip the product on my skin to ensure I don’t waste any of it. Just like the toner, this is SO refreshing and cooling on my skin ~ very soothing. It has a slight slipperiness to it but absorbs quickly and easily into my skin, leaving no tacky or greasy residue. It is not sticky at all ~ perfect for day time use for me. Again, for some reason, this doesn’t registered high on the hydrating levels, with only an increase of 17% but I do think that is because it absorbs so quickly into my skin. 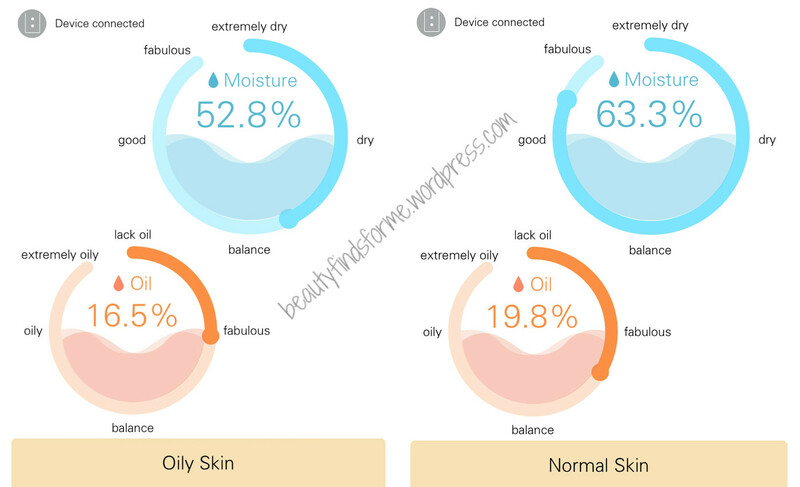 I do consider this a hydrating serum for oily skin ~ however, if you have dry skin, you might need some additional moisturizers and hydrators. This serum is great for blemish prone skin as it helps heal any blemishes you might have ~ I noticed that it did a lovely job keeping my oil at bay while healing my skin. However, and this is where YMMV ~ I didn’t see any improvements with wrinkles or pores during my time using it ~ this product does not claim to do that, but I was reading some reviews on their site and people were saying it helped reduce wrinkles, fine lines and pore reduction ~ if this serum doesn’t do that for you, that is okay, as it is not marketed as such. I am so glad that JKosmmune sent me these items to try! They also have other items, such as moisturizers and shampoo, but these 3 products really work well together.. and by themselves! I would have to say that I think that the standout item here for me is the Enzyme Powder Cleanser. It hits all of the sweet spots for me and best of all, it is very affordable too. I have been using this cleanser since October and I haven’t even used up 1/4 of the bottle yet. A little goes a long way and according to JKosmmune, I have 9 months from opening to use this all up. I have found my replacement for my Naruko cleanser and will purchase this product again. The Toner is a nice hydrating and soothing toner that is very refreshing while cutting thru the oil on my skin ~ this product is more for the summer time for me, as it is so watery and cooling. The Serum is another standout item as I had been looking for a beta glucan watery type product that I could use during my morning routines ~ this fits the bill. I would say a little goes a long way, but I have been using so much of this product that I am 1/2 through the bottle. I guess I use more than I should but I really love how refreshed my skin feels after using this. This one is more expensive than I care for ~ if it goes on sale, I would purchase this for sure! Many thanks to JKosmmune for sending me this trio. Have you tried JKosmmune yet? 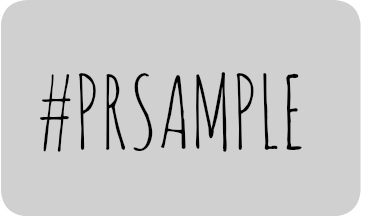 What did you think of their products? They also have skincare kits, where you can choose the type of lotion (normal/oily or normal/dry/sensitive) and get the cleanser, serum and/or toner. You can save 15% off your entire purchase at JKosmmune using promo code JKOSMMUNE15 ~ this is not an affiliate code, it is just a promo they are currently having. They have free USA shipping with any order $50.00 or more and they do provide international shipping as well. Dr Roebuck’s POLISH 2 in 1 Facial Scrub & Mask and Ultimate Hydrating Serum Review + Coupon! My sister loves some Korean Enzyme Cleansing Powder,.. I’m not sure about the brand name,.. Thanks for reviewing. Sad to say the toner is way too expensive when there are cheaper and better alternatives like klairs and laneige skin refiner, both of which contain beta glucan and betaine.